WHAT DOES IT MEAN WHEN A RING HAS TO BE RE-TIPPED? Re-tipping a ring is simply adding platinum, gold or sterling silver to build up the prongs on a ring so they are durable again. Normally you only really hear about rings being re-tipped because they take the most abuse. It is to be expected that rings wear down the fastest because we have them on our fingers all day, every day. Our hands are constantly moving, bumping and knocking into things. Our rings and therefore our prongs take a good amount of abuse. It is surprising that prongs hold up as well as they do considering the wear they receive. Over time prongs can get bent, broken, lifted or cracked. What are signs your prongs may need repair? If you run your fingers over the top of the prongs you should be able to feel small rounded nubs sticking up. Once the prongs begin to feel smooth and are even with your diamond or gems you should bring the ring in for inspection because it’s likely your ring needs re-tipping. Fixing prongs is not a difficult repair. A jeweler will melt gold (or whichever metal the ring is made from) into a small ball and solder it onto the tips of the worn prongs. 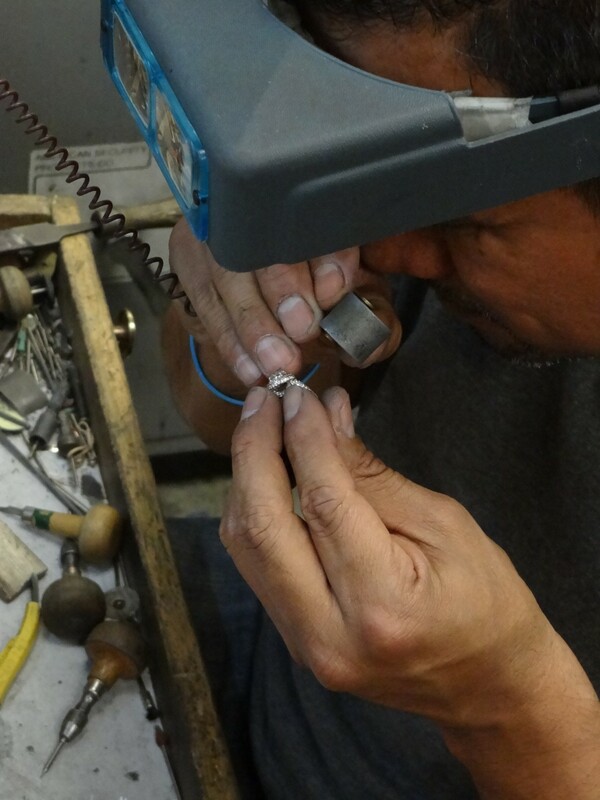 The prongs are then filed or fashioned to be smooth and polished so they look new. Take a look at the Image below that shows regular strong prongs, low prongs that need maintenance and prongs that have been re-tipped and are durable. That’s Re-tipping! Have your ring cleaned and checked! It is recommended that you have your rings cleaned and inspected by us at least twice a year that way if you were to have a loose stone or a worn prong we can fix it before a stone is lost. It is just being responsible for your ring it is preventive medicine that is worth the time + effort. Prongs are like most things in our life, they wear down and need is a little maintenance from time to time. Come into our store today and we will happily clean and inspect your jewelry! !